Solid sterling silver men's cuff ring from Nepal. The ring is well crafted and has beautiful details. Featuring a hand carved and etched image of Cheppu, the mask of protection. Cheppu can also be seen at the main entrance of many stupas and homes as a protection from all dangers. 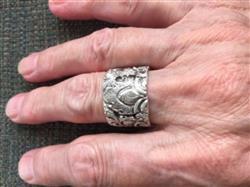 Sized ring measures approximately 3/4 inch wide. I love this ting and have received compliments on it’s detailed work... GORGEOUS! Heavy sterling yet comfortable! It is labeled a man’s ring but, not just. I do wish women’s rings came in size 10, I’d be purchasing more from this company! Lovely to work with!